Next month, on this date, it will be Easter! Oh my, this year is off to a fast start and I’m sure it will fly by! My three cards for today feature the February release products from ODBD. Not only does ODBD have beautiful sentiments but their dies give you the choice of cutting, embossing or both, for more detail in your die cuts! 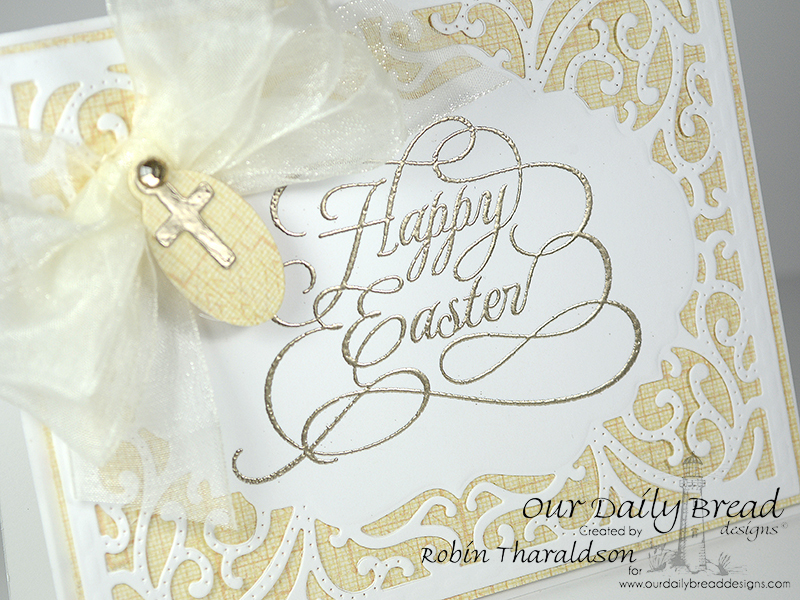 For my first card I HAD to use the beautiful Flourished Happy Easter stamp again! I seriously love this stamp. I cut the Vintage Flourish Pattern die from white card stock and then stamped Happy Easter with VersaMark ink onto the center of the panel. I heat embossed with Ranger Liquid Platinum embossing powder. The Flourished Pattern die was adhered to a cream background and added to my white A2 card base with foam tape. I created the oval/cross embellishment using the Mini Tags Die set and added it to my bow. My next card uses the Boho Egg die! With this two part die I used the solid egg shape to cut my pearlized paper and then the embossing feature of the other die to create a beautifully detailed egg. To create the bow I used the Medium Bow die set and cut using the same pearlized paper. The embossed back panel was made with the Quatrefoil die and dry embossing with my die cutting machine. Check your owners information for the correct sandwich to emboss with dies. The panel was added to my A2 card base with foam tape and the the egg was added with foam dots. The bow was added with hot glue; seems to work best for shiny paper. My sentiment, from the With Much Thanks stamp set, was stamped using VersaMark ink and Ranger Silver embossing powder. I added two pearls to finish the tag and added it to my card with foam dots. I went for a CAS design for my third card. 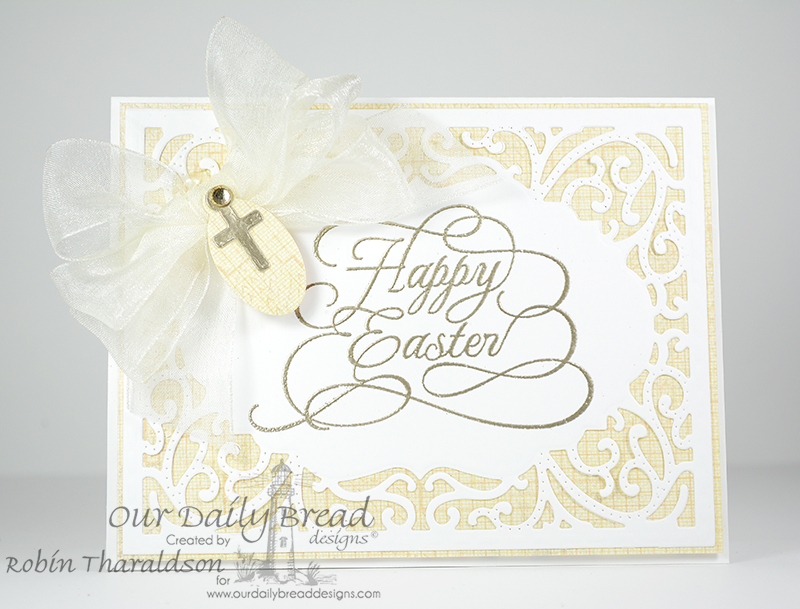 I cut a white A2 card base, positioned the Happy Easter die along the bottom and cut out with my machine leaving a negative space. I used the same technique with the large solid die from the Easter Eggs Die set to create three negative spaces. I wrapped a yellow ribbon around the card front and adhered with tape. I cut a white panel slightly smaller than A2, covered it with tape runner and added to the back of my card front. Now all the negative spaces had adhesive in them. I then cut the shapes again, using the same dies, from bright colored card stock. The shapes were added to the negative spaces on the card front. I cut three Large Decorative Eggs from white card stock and added with foam dots. The cute flower, also from the Easter Eggs Die set, was cut from yellow paper and added to the center of each egg with glue. To finish a rhinestone was added to each egg. For more ideas be sure to visit the ODBD Gallery! Once there you will many ideas to help your creative juices get flowing! Hi, I'm Robin, thanks for stopping by my little craft room in cyberspace! Here I hope you find inspiration, learn new techniques and see what I'm creating in my world made of paper, ink and imagination! Thank you! You have successfully subscribed to my blog. To subscribe to my blog and stay up to date with new posts, please enter your email address. All content (including text, photographs, and design work) is ©Robin Tharaldson. My original artwork is shared for personal inspiration only and may not be copied for contest submission, publication, or sale. Please be sure to give proper credit. Thank you!